When this time of the summer hits, the only recipes that really appeal to me are those that require no application of heat. I know, I complained about the weather last year. It just gets so hot in New York! (It does!) 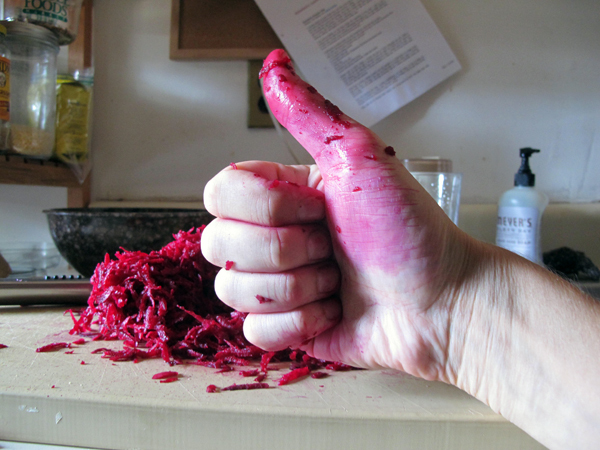 When I started getting beets a few weeks ago through my CSA I was first a bit irritated. I love them, but surely someone at the farm must know how much heat is generated in cooking them. I quartered and steamed beets a few times, which doesn’t take as long as roasting does, but even that seemed to penetrate my apartment with enough hot air that it simply wasn’t worth it. I included it in the cooler last weekend when my friend Katie and I went to the beach. It tasted terrific—refreshing and easy, as beach food ought to be—against the soundtrack of crashing waves and combative family arguments worthy of any reality TV show. And as a light lunch it perfectly complimented our Vodka-Frescas. What? How else are you supposed to beat the heat? 1. Whisk together the lime juice, olive oil, cumin, salt, and pepper in a large mixing or salad bowl. 2. 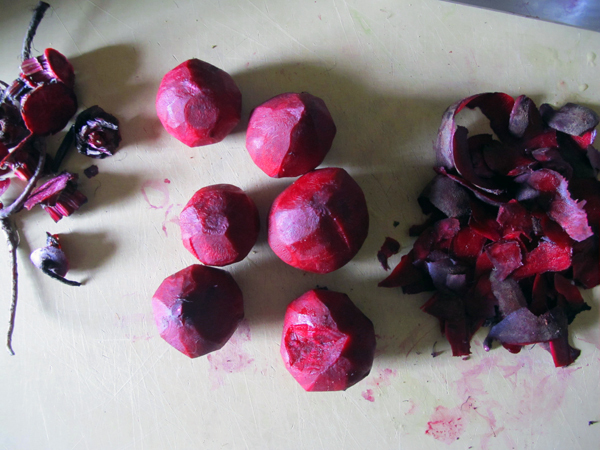 Trim the ends of the beets and peel them with a vegetable peeler. Use a box grater or a food processor fitted with the grating attachment to grate the beets. 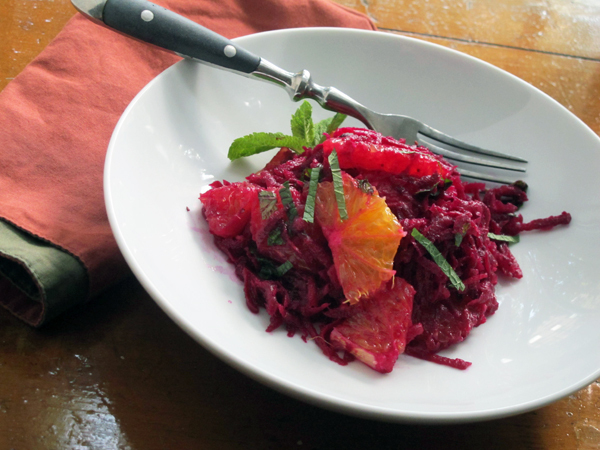 You should have about 2 heaping cups of shredded beets. Add to the bowl with the dressing and toss to coat. 3. 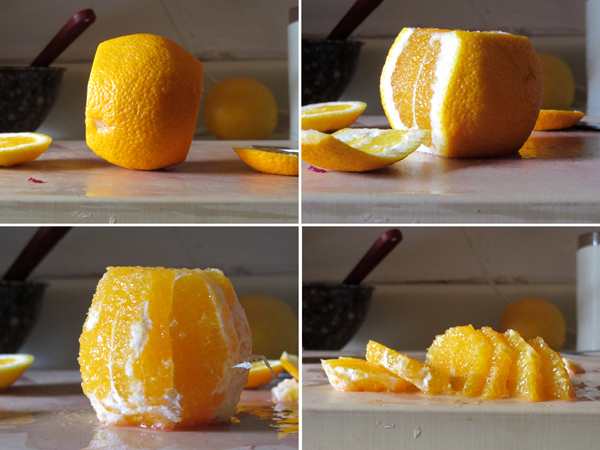 You can bypass this step by just peeling your oranges and chopping them up as you please, but if you wish to cut half circles like those pictured above, follow these this method, which is the beginning part of supreming citrus (which is when the segments are cut out individually from the fruit—primarily for grapefruits and blood oranges, where the membranes aren’t edible): Slice off the top and bottom ends of the oranges. Place the orange on one of its flat ends on a cutting board. With a sharp chef’s knife, cut off the peel and pith in strips all the way around the orange, following the curve of the fruit. Slice the orange in half lengthwise (a serrated knife cuts through the fruit very swiftly), and then into half-circles. 4. Add the oranges to the beets, and try to collect the juice from the cutting board and add that to the bowl as well. Add the mint and gently toss to combine. 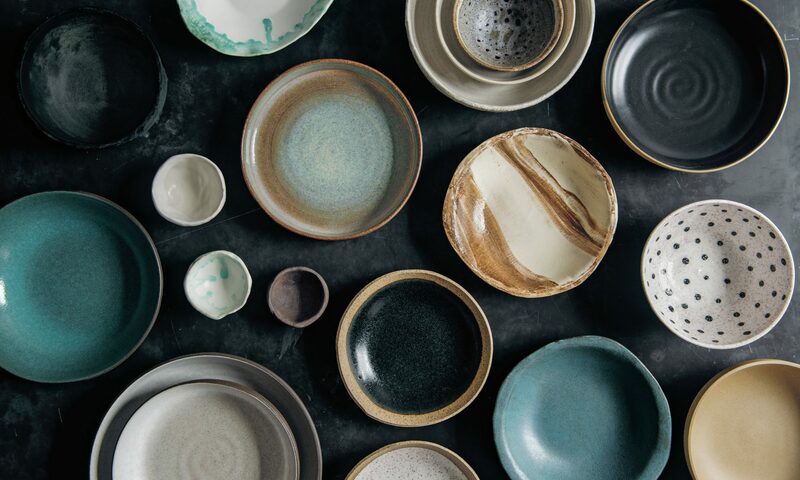 Serve at room temperature or chilled, garnished with the mint if you’d like. Wow, thank you so much! You just made my day.